Yep - this was a DeBartolo Mall, and they all had that same sign. Randall Park Mall STILL has it, and Southern Park Mall in Boardman (outside Youngstown - DeBartolo's HQ) - Randall Park's former sister mall - used to have the same sign. By the looks of the word "CINEMA," the theater must have been owned by General Cinemas. Seems as if all their signage in those days was limited to "CINEMA" (and sometimes the number of screens, such as I-II-III) in that red typeface. When I said the sign without yet reading Keith's description I thought that it did look exactly like the Randall Park Mall sign from the video. 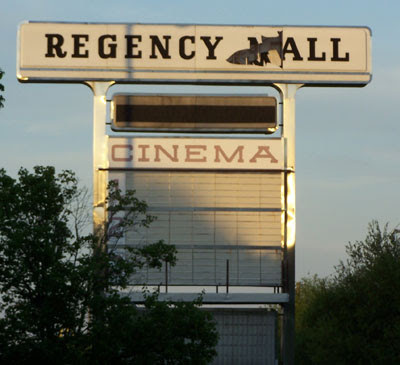 Naugatuck Valley Mall in Waterbury also had that Cinema signage sans the top part of it with the mall name. It seems that old mall also had a General Cinemas in it as well. The signage of the mall I'm talking about is exactly like Regency Mall and Randall Park except it doesn't have the extra two rectangular signs above it nor the small little attract sign below,which would lead me to suspect that the Naugatuck Valley Mall might of had signage above and below the cinema sign when it first opened in 1969,that was for some reason was removed later on and the replacement sign used to display the malls name was smaller. If that is indeed the case then we may be talking about the same developer. BTW the Cinema sign is still there and is still used gratefully to display movie titles however it had been retrofitted. you can see the big sign to the right in this pic after the mall was demolished. sorry only closet pic I could get. For some reason that picture makes me so sad! Reminds me of what's happened to Southwyck Shopping Center here in Toledo (the only bright side perhaps is the "lifestyle center" shtick my city's bothering to do to 'save' it). I drive past the Randall Mall sign every morning (different way home at night) and it saddens me that the place I had so many good times has become a symbol of urban decay, white-flight, and thug insurection. I'm wondering, does anyone have any pictures (video or still) of Randall Park Mall from 1985 - 1995 (ish) for a project I'm working on? I'm not sure if that will help figuring out if the developers the same or not. now, you see the area in the back center of the mall,where the two wings meet? behind the peaked roof and pentagon shape,with the two box shapes? (one with a roof that looks a pair of gray doors on a white box next to a barely visible tall and skinny one) that sort of protruding out a bit? thats the area where the old movie theater was. Okay, about General Cinemas and their signage,was Showcase Cinemas owned by General Cinemas at one time? because their signage was almost identical to General Cinemas. might give a better understanding of who owned Showcase Cinemas back then and if there is a connection to General Cinemas. I found those pics on Cinema Treasures. AHA! I found a closer picture of what the big Cinema sign looks like today! Last time I was there, Brunswick Square Mall (in NJ, another former DeBartolo Mall) had an identical sign. All DeBartolo malls are jinked. Can you show me one thriving DeBartolo mall or one struggling Simion mall. Although I lived on the other side of town, I loved this mall. It breaks my heart to see it abandoned.I had some really good times here as a teenager. It was our hangout in the summer just about everyday.They played midnight movies at the theatre.I saw Rocky Horror Picture Show and Texas Chainsaw Massacre.I wish someone would buy it and turn it into an outlet mall. We could really use it on this side of town now.I have alot of good ideas for it just no money to buy a mall.lol. We have the experience and the pride in Restoring Terrazzo Floor Fort Lauderdale and want to earn your business. Regular weekly Cleaning Terrazzo and maintenance with a neutral soap and water or Colonial can provide the best cleaning solution for your floor. Don't waste your time driving from one builder to the next only to hear,"This factory builds the best homes".Get the facts with fair and balanced ratings from a consumer group with no ties or connections to the Modular Homes industry.